I wish I had taken a still shot of the cheap looking nests. They were cute but they looked cheap and were too bright for my taste. When the boys were little I might have left them as is but I knew I could upcycle the eggs and nests in no time. This is an image of what they look like after a little paint and some German glass glitter. So, I might have mentioned that I have a youTube channel. My son created it for me. I have a quick how-to video of this upcycle on it. 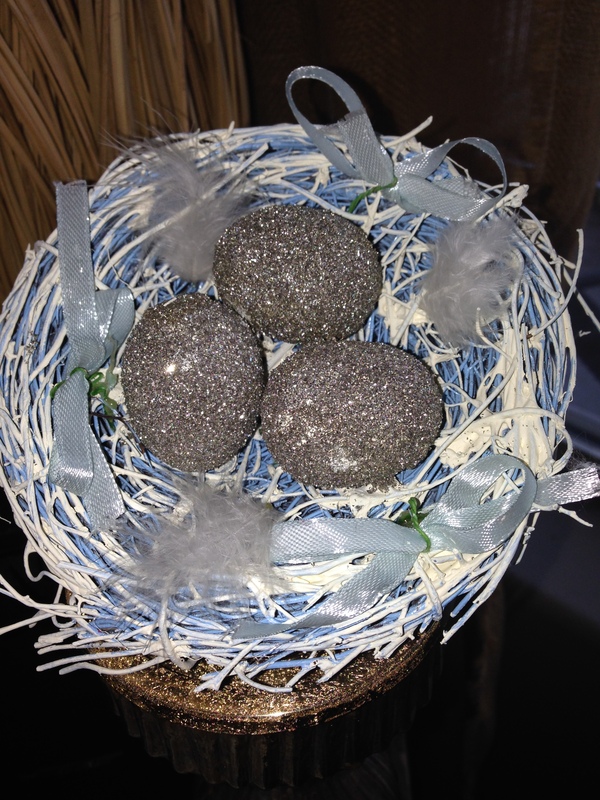 I took dollar store Easter baskets and glass glittered the eggs and added some paint to soften the blue nest. It really is that simple. Spend two bucks. Take everything out of the nest. Paint the nest. German glass glitter the eggs. Once everything is dry reassemble the nests. I put mine on top of champagne colored glass candleholders in a seasonal vignette. Check out my youTube channel at Trishcreates to see exactly how-to! Happy Throwback Thursday! I have a blog about the Golden Easter Egg. When the boys were little we read a lovely pop-up book about Easter eggs and all of these lovely springtime animals were on the egg hunt. The golden Easter egg was the prized egg. 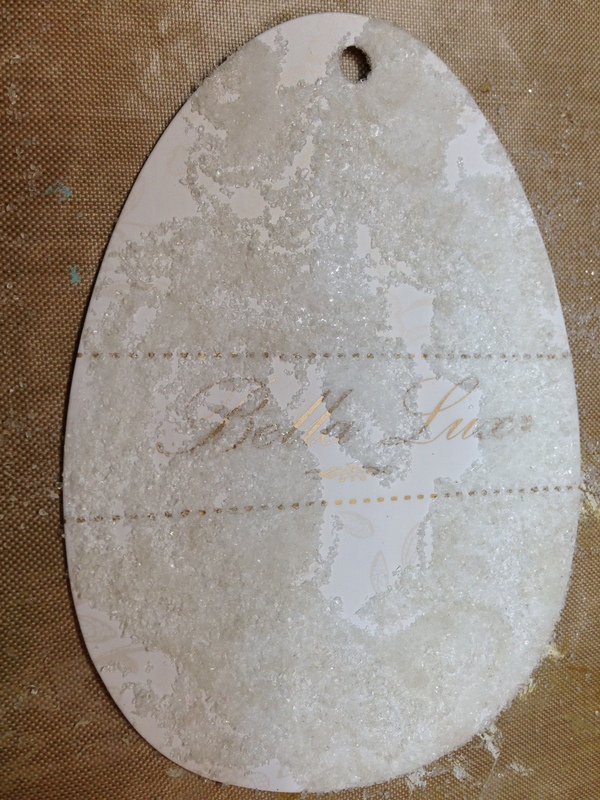 Long lovely story short we created a golden Easter egg tradition in our home. At the time we created the tradition there were no ready made golden Easter eggs on the market. Now they are everywhere but back then not so much. This is an easy craft with elegant results. Better than the plastic golden eggs of now. 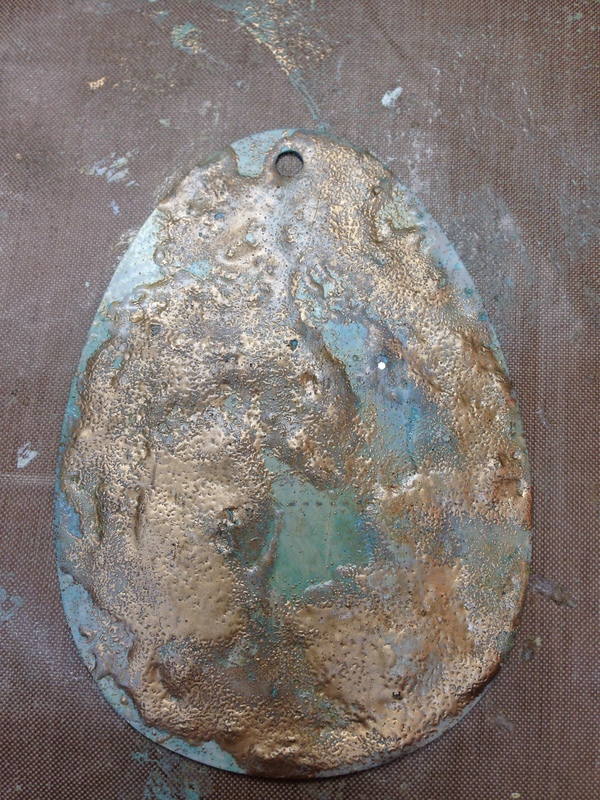 The egg in the images is actually a porcelain egg that I spray painted with metallic gold paint. My girlfriend told me she picked up a dozen of plastic craftable eggs in a carton at Walmart for like $2.00. These would be perfect to work with as they are created to take paint and you won’t have to worry about breaking the golden egg. 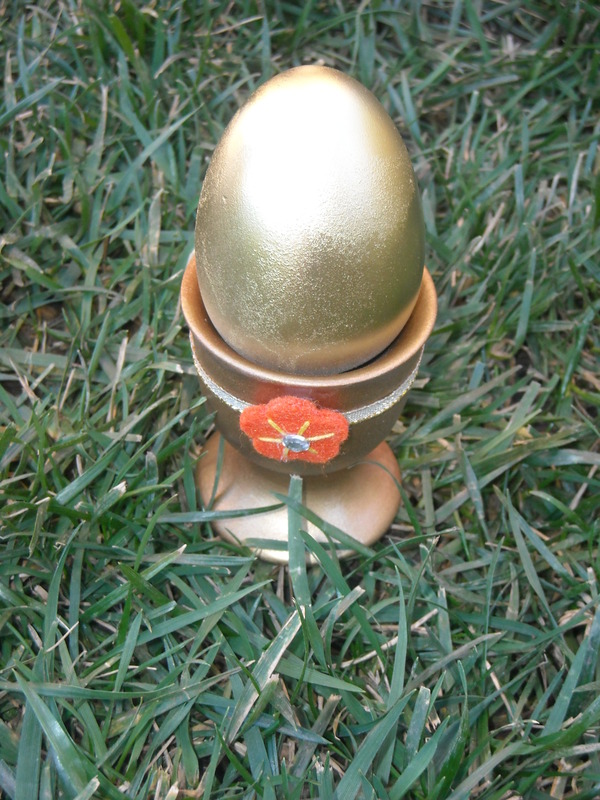 Because the egg is so special I also created a golden egg cup for it to stand in for Easter brunch. 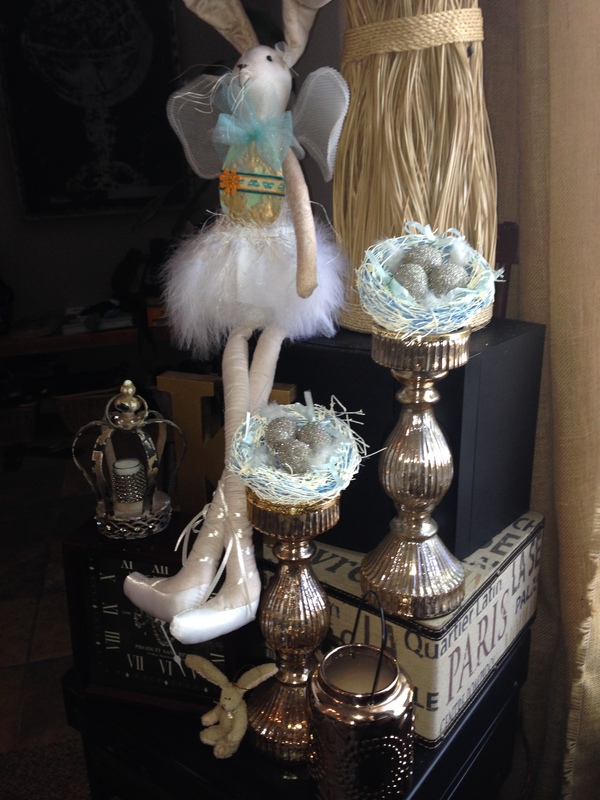 I spray painted the egg cup with the same metallic paint and added some metallic ribbon and a little felt embellishment. So sweet. 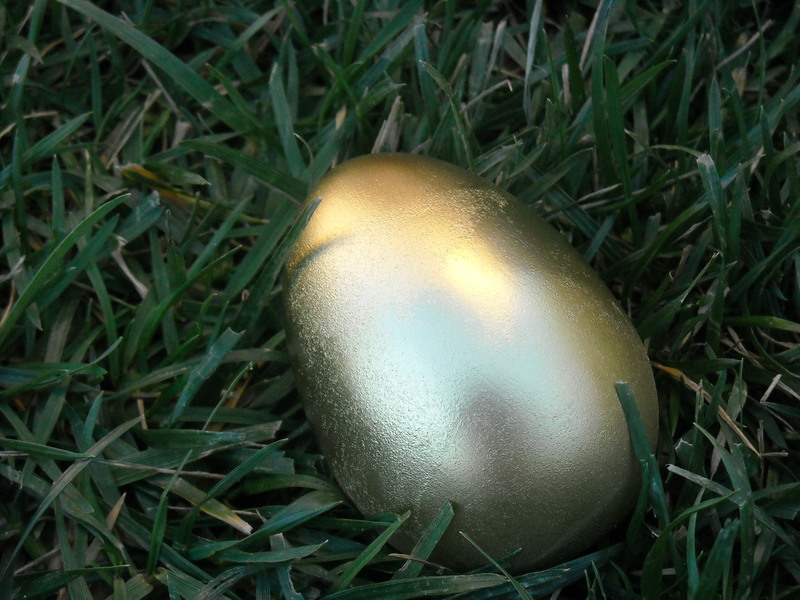 So, the golden egg was painted and laid in the grass or a more difficult hiding spot as the boys got older. Whomever found the golden egg won the coveted golden egg. Hiya. So I know there is going to be a big announcement tomorrow but I am super excited about today’s tag. Maybe almost as excited as I am for tomorrows post. So, I discovered the fab egg tag while removing the tags from my bunny and thought, “hmmm. 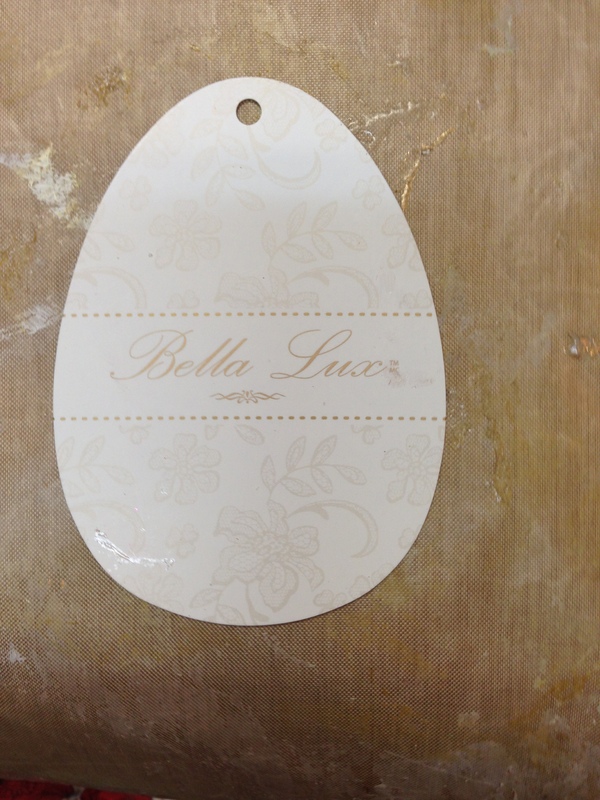 I should make an Easter egg shaped tag since it is indeed an egg shaped tag. Then I promptly forgot all about it. Fast forward a few weeks. I was working on a new technique and thought wow this resin resist technique would make a really cool speckled egg. So, then I had to dig around and find the tag because of course I didn’t put it in my tag bin as I knew I was going to do something cool with it. So, because this is my blog and I get to do what I want I am not going to share the technique with you here and now. I am making a video with my boy sharing the technique. He created a youTube channel for me. You can find my new channel at youTube/Trishcreates. There is even one video already posted. This video will appear in due course. You will be the first to know when this technique is posted. In any case, enjoy the images. Love the tag! I think the tag looks a little like a misshapen planet Earth but just you wait…It looks like an Easter Egg in no time! 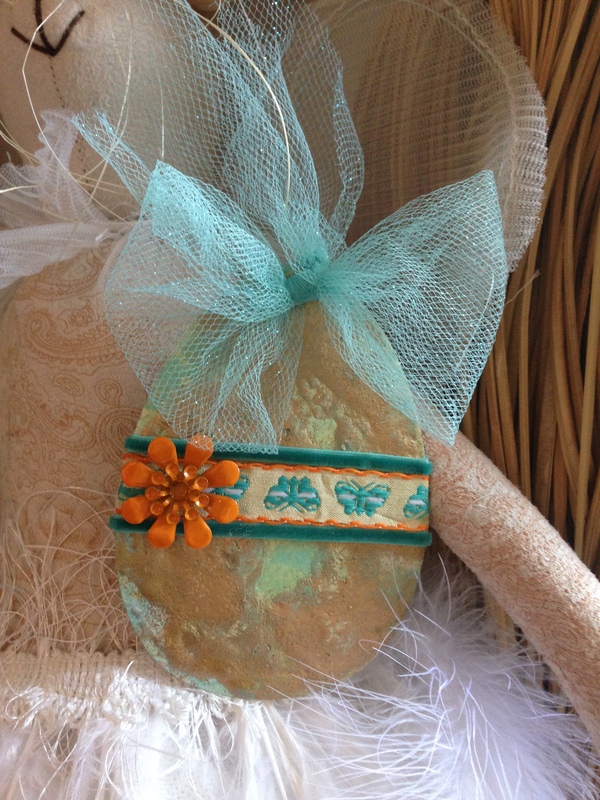 A little ribbon, a little embellishment and it’s a beauty. Also, you can partially see the bunny it was originally attached to “holding” the egg tag! Hope you are getting into the spring holiday spirit. Easter eggs are a big tradition in our household. They were a big deal when I was a kid and they are a big deal now that I have kiddos. 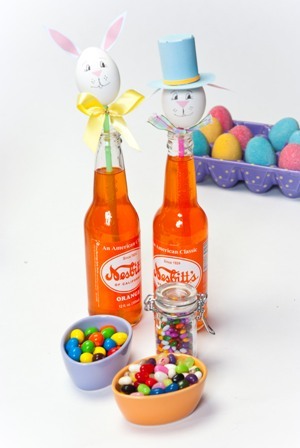 In fact, every Easter we have gotten together with family and neighbors and spent the evening decorating Easter eggs. It is a big ta-doo. We have decorated dozens and dozens of eggs. Each year we seem to decorate more and more. Some years the eggs are traditional Easter eggs with Paas dye, vinegar and some really muddy looking eggs. There always seems to be one or two that are left for the whole evening in the vinegar bath. Sometimes this effect is saturated and stunning and sometimes its just plain bright. 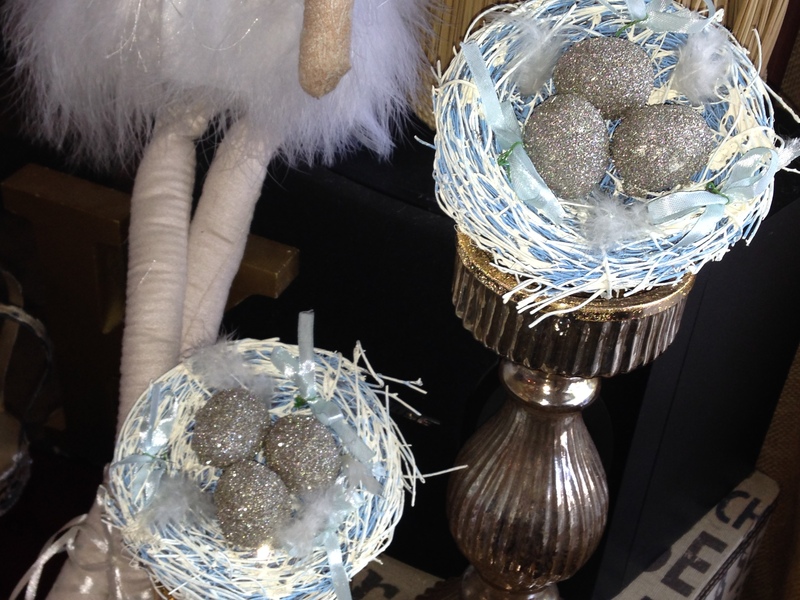 Some years we go a little crazy decorating and the eggs are little works of art (always a good thing). One year after the boys went to bed my girlfriend and I spent the rest of the night (and it turned into a late one) blowing eggs and creating little hats and ears for our blown eggs. Some of our creations were pretty incredible if I don’t say so myself. Below is a picture of Mr. & Mrs. Bunny. They were inspired by a crafty Easter book we were looking through. The Easter eggs were o’ so delicate but just plain darling. We loved them immediately. They took a lot of (pleasant) effort, some frustrated groans, some laughing… as you can see, the end product was well worth our time and the death of many broken eggs. I hope Mr. & Mrs. Bunny bring a little Easter joy to your day. Hi. Hello. Happy almost spring! Some of you know that I am a big fan of afternoon tea. 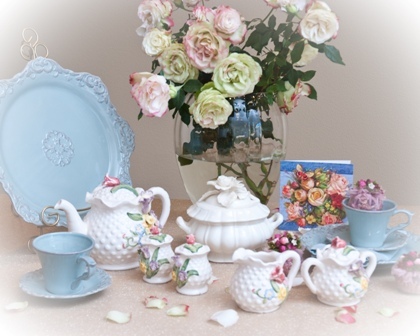 While I am not inherently a fussy or even a sweet girl, I do love the pomp, tradition and prettiness of afternoon tea. To that end, a few years back I put together an afternoon spring tea perfect for any of the upcoming spring holidays like Easter, May Day or Mother’s Day or just because spring is a pretty time to sip from a dainty cup and nibble a scrumptious sandwich. It’s sweet alright but wouldn’t it look so pretty on a table in the garden? Maybe we can wear hats, celebrate and giggle softly while our champagne bubbles and our tea cools.